I have kind of a thing about Bad Dads. Some of my favorite (not Trek) movies are The Royal Tenenbaums and The Life Aquatic (and you can just go ahead and tack on the rest of the Wes Anderson collection while you're at it.) My favorite Shakespeare plays are King Lear and The Tempest. I thought a lot about this over the last few days as I watched three different Voyager episodes: The Persistence of Vision, Tattoo, and Resistance. In The Persistence of Vision, the entire crew is put into a trance by a crazy alien who wants to take over Voyager. Each member sees who/what they want to see. Janeway sees the boyfriend she left behind, B'Elanna sees a hot-for-her-Chakotay, and Tom Paris sees his dad. Let me clarify-- his Bad Dad. Tom's dad is a tough-as-nails Admiral who was pretty hard on young Tom who never felt like he lived up to his dad's expectations. It was a long-needed confrontation with his imaginary dad that finally pulled Tom into la-la land in this episode. 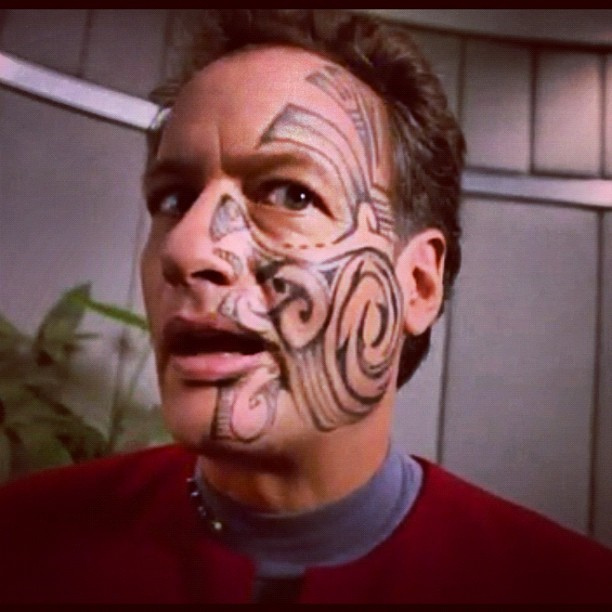 In Tattoo, Chakotay's dad isn't really bad. He's just super invested in getting Chakotay into his Indian heritage. This isn't necessarily a bad thing but I guess when you're a teenager the last thing you want to do is mess around in the buggy rain forest with no tricorder or toilet paper. The high-school-flash-back version of Chakotay is pretty pissed through the whole episode and even talks about leaving the tribe. Obviously was is before he found his animal spirit and all tatted up. "Um, no Q. That's too much. Go consult your ancestors and try again." Finally, there's Resistance which is one of my very favorite episodes of Voyager. Janeway and her team get into some trouble while trying to procure some tellerium on a planet that's all jacked up with war. 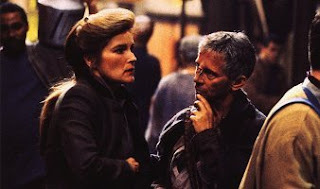 While Tuvok and B'Elanna are thrown in jail, Janeway is rescued by a delusional resistance fighter who's harboring guilt for his past Bad Dad behavior. His Don Quixote nature, too-little-too-late assistance to his wife and daughter, and the way he latches onto Janeway get me right in the feels. Every. Single. Time. I could speculate here about why episodes like this get to me. I might think about how Bad Dads are usually more complicated than they first seem, how they love their kids but have a tendency to sabotage their relationships, how they make great characters because of their compelling self delusion. I could think a lot about that but too much meditation on this subject would probably leave me staring at the wall like Tom Paris--on the losing side of an imaginary confrontation. Interesting topic. You should add EVERY Noah Baumbach movie to your list, too, because that funny man has daddy issues! Squid and the Whale, anyone? Btw, The Tempest is my fave, too. Congrats on all of your recent success!